For maps in .png format, use the High Resolution button on the individual map pages. Download the community atlas from above, and unzip it anywhere on your computer. Then open the Start.fcw file from the root directory of the archive to get started. NOTE: Do not open the maps straight from the zip archive, always unzip it first. If you open maps straight from the archive, navigation links won't work, and maps that require additional resources from the archive won't be able to load these. The maps in the atlas are made using a variety of style originating from a number of different products. If you see a lot of "Red X'es" when you open up a .fcw, it is because you do not have the required products installed. You can always check what products a particular map requires by clicking the Map Info link, and read the Required Products map note. You can also check out the map in the online map browser to see how it is supposed to look with everything installed. If you can't view the map properly, but do not wish to purchase/install the required products, keep in mind that you can edit the map and change out missing symbols and fill styles. For example, you can change the path used by a fill style definition through the fill style dialog to instantly use a different texture. If you have access to a similar texture to the missing one, the map will probably still look quite ok. 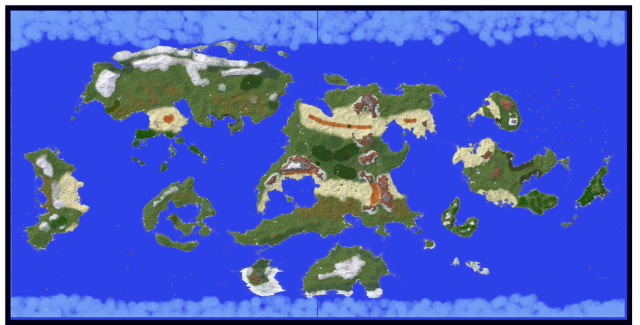 This is a conversion of the world of Nibirum into a Minecraft world. The map is for the 1.12.2 Java Edition of Minecraft. The map itself was generated using a couple of mods, but the world itself is pure vanilla and don't need any mods at all to play. Note that you should play this map using 1.12.2, newer versions of Minecraft uses a new map format, and in my experience, while things look fine in 1.13 initially, Minecraft doesn't manage to convert the map over properly, corrupting and regenerating a lot of the existing chunks, making everything a mess. Note that the map is generated from a height map generated from the original FT3 data. This may not always match what people have been doing when making CC3+ maps from the world. Also, the heightmap didn't contain terrain data, so I've done some basic biome painting, but don't expect everything to match the CC3+ maps. Note that this is a huge download, almost 6 GB in size, so please only download it if you actually want to try it. It is useless outside of Minecraft.